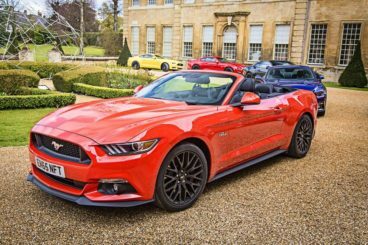 The Ford Mustang Convertible became available to purchase in 2016 in Britain for the first time in its illustrious history. A trickle of them have been previously imported from the U.S. by private buyers, but the official release to all of us has certainly been a long time coming. So, what’s actually in it for you now that this iconic American car is finally here? Easily one of its strengths is its reasonably low asking price; compared to its rivals in this sector, it costs a lot less. For the price, you get bags of character, unrivalled heritage, as well as an intoxicating V8 engine. 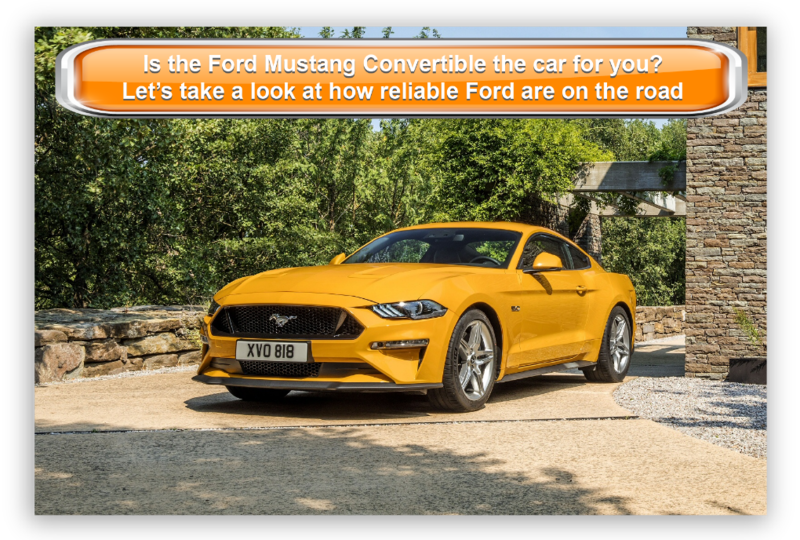 If you’re thinking of getting your hands on this American superstar, join OSV as we take a closer look with our Ford Mustang Convertible review. The Mustang Convertible can’t tackle bends with the thrust and confidence of the Coupe variant. The front and rear suspension is fully independent for the first time, but without a roof the cabriolet just feels too loose and soft. The body grimaces when you ride over potholes, while it wobbles and shimmies whenever you pick up speed on B-roads. Think of it more as a cruiser than a convertible and you won’t be too disappointed. There is a pair of engines available – the more frugal turbo-charged 2.3-litre four-pot EcoBoost unit, and the classic V8 5.0-litre that most customers will be looking to snap up. With that said, you shouldn’t dismiss the EcoBoost engine too quickly. It’s more economical, but it’s actually also a pretty good performer. It can develop 316bhp, and covers the 0-62mph dash in a matter of 6.0 seconds before maxing out at 145mph. Its four-cylinders are well muted, but Ford has added a sound synthesizer which pumps power plant sound into your cabin. The unit comes wedded to an impressive 6-speed manual ‘box, which gives satisfying changes – but we’d argue that the six-speed automatic transmission is better suited to this car. The meaty V8 power plant will cost you an extra £4,000. But that’s why people buy this car in the first place, right? It’s going to cost a lot to run, but the menacing soundtrack and the power are part of what makes this car exactly what it is. The interior of the car is very retro. It’s not gimmicky but has held onto numerous design elements from classic Mustangs of the past. At the same time, Ford has introduced advanced technology which brings the interior nicely into the 21st century. The dash is covered by a huge slab of aluminium, while the air conditioning is controlled by metal toggle switches. Ford has added their new SYNC 2 infotainment system, and it dominates the dashboard’s screen. It’s controlled by a large, easy to use the touchscreen, and it’s pleasing to the eye. This is the same screen that’s found in the Mondeo and Focus. Fit and finish let the Mustang Convertible down somewhat. It isn’t on par with what the European’s are doing, with the plastics and various materials falling short of the standards set by the likes of BMW and Audi. They’re just not very robust, and we can’t imagine them lasting too long. They’re also scratchy and not pleasant to look at – in short, they’re typically American. At the same time, the Mustang doesn’t cost as much to buy as a German car. Take the roof down, and the Mustang will become less rigid – like pretty much all sports cars that are converted into convertibles. As such, it’s not really a proper performance car but is more of a comfortable cruiser. Typically for an American car, it’s super wide. Take this out for a scenic stroll through the British countryside, and its width is something you will feel conscious of. This is a four-seater convertible, and it’s pretty practical. The pair of rear seats can accommodate two adults, but they’re better for shorter journeys as opposed to longer ones. There is a huge central cubbyhole for storage, while door bins offer an impressive amount of space. The glovebox is a tad small, though. The boot, meanwhile, measures 320-litres, which is decent. It’s more than previous Mustang Cabriolet’s offered, though it’s not best in class. It should be able to accommodate a pair of big suitcases or a few golf bags, but it can’t be extended by lowering the back seats. The boot lip is also pronounced, making loading a little awkward. Standard equipment across the range is good and includes a trip computer, rear window defogger, air filter, brake assist, Bluetooth compatibility, speed sensitive turning, cruise control, and a driver information centre. Parking assist comes as an optional extra, as does engine block heater and limited slip differential. Prices for the new car start out from around £35,500 and rise to just shy of £40,000. If you want to lease the vehicle, you can get a deal as cheap as £500 + VAT, or you could pay as much as almost £1,000 + VAT over three years. It will come down to your exact specifications. This is a sports car, so it’s not going to be cheap to run. And if you opt for the classic V8 engine, it’s going to be far from being cheap to run. There are two engines up for grabs, with the thirsty V8 petrol unit achieving average returns of around 20.8mpg while emitting 306g/km of CO2. If you want a Mustang Convertible but don’t want to have to pay through the roof for it, the 2.3-litre EcoBoost petrol engine might be more up your street. This engine is shared with the Ford Focus RS, and here can achieve respectable returns of 34.4mpg. Servicing will not be cheap, but the standard three-year/60,000 mile warranty can be extended should you wish. It does, however, come with a good reputation for reliability and should protect you well in the event of a crash. But because this new convertible hasn’t been on the streets for very long in either America or Britain, it’s impossible to say just yet how durable it will prove to be. It does, however, have a decent track record in the U.S. Us Brits have been waiting to get our hands on a Mustang for decades – at least officially. It’s an iconic car that has been the ultimate star of a succession of seventies U.S. movies, including Gone In Sixty Seconds and The Fast and the Furious. And as anyone who’s ever watched those movies will know, the Mustang has always had bags of character. The convertible has just as much – if not more. This convertible is reasonably priced, especially when compared with its European rivals, such as Audi and BMW. No model will cost you more than £40,000, which is impressive when you consider how classy this car is. Moreover, with power coming from a legendary V8 engine, the price tag suggests that Ford are practically giving the car away. 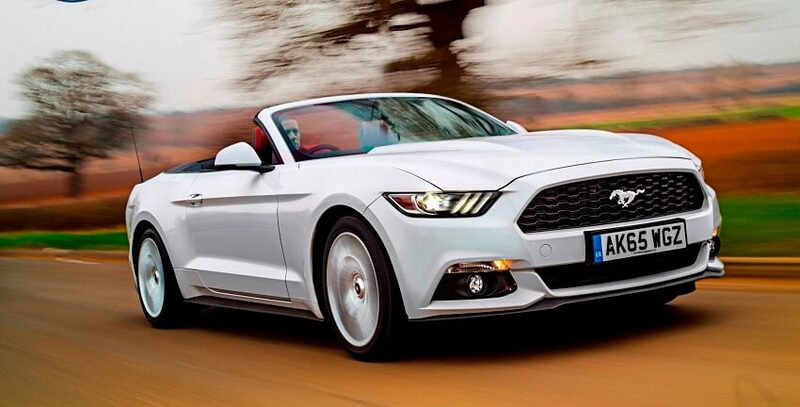 The Ford Mustang has unmatched heritage and is available to UK buyers for the first ever time. Anyone who is hesitating about snapping one of these up is probably never going to be persuaded. Basically, after all these years, you either want a Mustang or you don’t. Okay, sensible hat on now. After all, you shouldn’t buy a car based on the strength of its heritage and legendary status alone. As such, the Mustang does have a few cons. Inside, there might be too many hard plastics for your liking. American’s, however, are used to these scratchy interiors and it doesn’t bother them. And because this is priced lower than its German rivals, a cheap interior might also be something you’re willing to ignore. Sports cars cost the earth to run, but the V8 engine found here costs the universe. Averaging returns of around 20.0mpg means you’re going to be spending an awful lot of time at the gas station. Despite its prestige and reputation, the Mustang might not be the car for you. Let’s see how it measures up with its rivals in the comparison section of our Ford Mustang Convertible review. 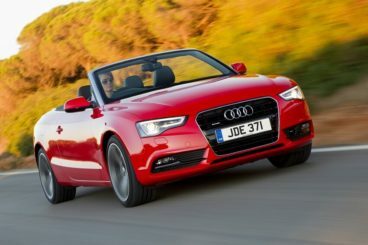 The Audi A5 Cabriolet is classy, stylish – but not all that fun to drive. It is, however, easy to drive. The controls are responsive, ensuring that both long and short trips, either on the motorway or on twisting country lanes, are fairly simple. The light steering is another positive, while Drive Select System lets you modify the comfort and steering settings so that they match your preference. The problem is that finding the right balance between comfort and weight of the controls is virtually an impossible task, and this can be frustrating. While the Mustang is not the sharpest handler around, it at least doesn’t over complicate matters. The Audi engines are quick, with the 3.0-litre TDI diesel able to cover the 0-62mph sprint in 6.3 seconds – a shade slower than what the Mustang can achieve. The A5 Cabriolet is more expensive than the Mustang, and one of the reasons for this is its classy interior. It’s smart, but there is a caveat here: It’s not as smart as it used to be. It’s starting to show its age, and doesn’t look as fresh as it used to. It is, however, still smarter than the interior found in the Mustang. Unlike the Mustang, the A5 Convertible is inexpensive to run. Thanks to the availability of efficient diesel engines, you can return around 57.6mpg off a sensible drive while emitting just 129g/km of CO2. 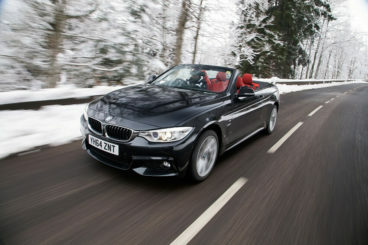 The new BMW 4 Series Convertible replaces the outgoing BMW 3 Series open top. It’s got a solid range of engines to choose from, a quiet and refined interior, and can’t really be knocked on the practicality front. The roof system always meant that the 4 Series convertible was going to weigh more than the coupe. As such, it’s not as fun or as agile. Rather than an out and out sports car, it’s more of a motorway cruiser. It’s not as quick and you will notice extra body lean. With that said, it’s not what you’d call slow by any means. True, you need a colourful imagination to pretend that this car offers staggering pace and performance, as a 0-62mph sprint time of 8.3 seconds for the 2.0-litre diesel engine is okay but not fantastic. The 428i, however, is more competitive with the Mustang and covers the same distance in just 6.2 seconds. However, it’s the top of the range 435i that offers the most scintillating performance of the range. It delivers 302bhp and can rocket you from a standstill to 62mph in a matter of 5.5 seconds before maxing out at 155mph. It’s overall cheaper to run than the Mustang. If running costs top your list of priorities, the entry-level 2.0-litre 420d is your best bet. It’s a reasonable enough engine that achieves fuel economy returns of 58.8mpg. However, since you’re thinking about snapping up a Mustang, we reckon you want as much performance as you can get. The speedy 435i petrol engine is spectacular on the road but averages fuel economy returns of 30mpg. Interior quality is good, with a lot of the materials and features taken from the coupe. This means you get rewarded with an easy to use dash that is well-built, as well as the brand’s awesome iDrive infotainment system which is the best of its type in the market right now. It’s user-friendly and looks the business. Overall fit and finish is a cut above the hard plastics you’ll find in the Ford Mustang. The convertible roof does limit rear headroom, and it also has a dampening effect on the boot. But 370-litres of space is still decent and is 50-litres more than you get in the Mustang. Once you drop the roof, space plunges to 220-litres. The Mustang has gone down in American legend alongside the likes of Bruce Springsteen, the stars and stripes and Robert De Niro. A car such as this cannot exist purely on the strength of its heritage alone. Although it’s an icon and a true champion from the land of milk and honey, it has substance to go with the myths that surround it – and it’s as good as you always thought it was. Commanding a relatively low asking price, the Ford Mustang Convertible is not flawless, but for your own slice of history and prestige, it’s well worth a punt.